Although there has been no official St George in Southwark Festival this year, there have been plenty of opportunities to celebrate him. 23 April was very close to Easter this year so he has been remembered on a variety of days -the pubs led the way on Wednesday 23. Borough Market have continued their link with the Catalan government and gave out red roses on Sunday 27. St George’s RC cathedral’s Chapter Mass was on Monday 28 April, the transferred date fro the Feast after Easter. Children at St George’s School wear red and white and have a special ‘English’ lunch. http://t.co/iOGXHvP4CE interesting blog from Bermondsey, partners in keeping St George multi cultural. 2pm – 5pm at St George the Martyr Crypt [map] with contributions from Southwark’s many varied communities, including MIA dancers, Blackfriars Nightingales, LSBU Confucius Institute, BOST making mini greenhouses (to plant firey chilli peppers! ), Ethiopian coffee ceremony and display of Ethiopian Christian art. See Facebook event. Many only think of St George as the patron saint of England, but the dragon-slayer is also the patron saint of many other communities, including Catalonia. In celebration of this, the market has teamed up with the Government of Catalonia for a special day to honour our shared saint, diverse cultures and traditions. Borough Market traders will be showcasing the best of their produce including a special English charcuterie platter from Cannon and Cannon, dragon-themed baked goods from Bread Ahead and specialities from Brindisa. There’ll also be demonstrations throughout the day focusing on English and Catalan dishes, including from the popular Catalan Cooking, alongside a traditional performance from Passamezzo. The exchanging of roses and books is a Catalan custom on St George’s Day and the UK delegation of the Government of Catalonia will perform the ritual with members of the public, while traders will hand out roses throughout the day. 1.00pm Festival Lunch at St George the Martyr. Come and see us and have a cuppa, a St George themed snack, and explore the creative space, the exhibition of images, performances and ‘son et lumiere’ projections.The Dragon Cafe should open regularly from 1 October 2012. 11am & 3pm Tours of St George’s Roman Catholic Cathedral, Lambeth Road, free. 11am-6pm Book Sale organised by the Friends of Southwark Cathedral in SW churchyard at the cathedral. Buy a book and receive a rose! Musical open-air theatre with the Lions part at four locations around Borough & Bankside. A vigil to honour the outcast dead of Crossbones Graveyard has been held on the 23rd of every month since 2004. Every April 23rd, St George is honoured at Crossbones as ‘Our Lady’s Knight’ and as the protector of spiritual works. There’ll be poetry, songs and simple participatory rituals led by John Constable (‘The Southwark Mysteries’) and other local artists. Bring a flowers or a memento to renew the living shrine at the gates, and a poem, song or something else to share. A celebration of Englishness at its most diverse and inclusive. Meet at the gates in Redcross Way, SE1 (opposite The Boot and Flogger). Finally: from 8pm New Esperance Morris and Hammersmith Morris start a tour of pubs in Bankside and Borough at Old Thameside Inn. In 2011 St George’s Day coincides with Holy Saturday, the day between Good Friday and Easter Day. The church moves the liturgical celebration to 2 May. This year St George in Southwark festival invites supporting organisations to organise their own celebration if appropriate. Events can be listed on this website. ‘There is no Spring without St George’: England’s patron saint in the folk traditions of Europe and beyond. Dr Sam Riches, Lancaster University. The fourth St George in Southwark Festival started on Thursday 22 April and ran till Sunday 25 April 2010. Ethiopia is the one African country which celebrates St George as a patron saint. Runs until Sunday 25 April. Local shops and stalls in Borough Market will be decorated to celebrate St George. From 12noon Â stalls will be selling themed foods, including St George magic cakes from Konditor & Cook to take away and street musicians will entertain. Learn about Southwark’s Roman Catholic Cathedral on the feast day of St George, its patron saint. Mass attended by the Chapter and Cathedral Friends. The relic of St George will be on display. Roast lunch followed by open-air theatre performance (see below). Phone Tina Johnston on 020 7928 9521 to reserve a place for lunch. Supported by United Charities of St George the Martyr. 6.45pm Gather at the gates of Crossbones Graveyard, Redcross Way, SE1 -Â a simple ceremony to remember the ‘outcast dead’ of our Borough. Make your own St George ‘keepsake’. Supported by CCF Grassroots Grant. 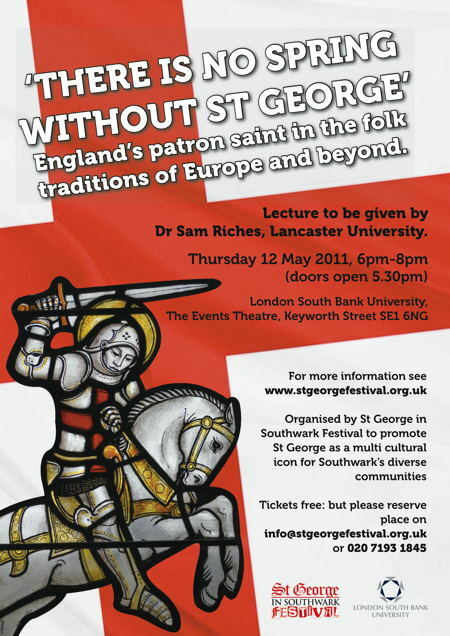 Come and discover what St George means to some of Southwark’s diverse communities. With dance, music, food and gardening. The energetic players gave 4 performances of the Ballad of St George & the Dragon around the Borough. Surprised people came to doorways in Rushworth Street as the drums and violin heralded their arrival at Blackfriars Settlement. Here 60 or so ‘Older persons’ and friends and neighbours, after a good roast beef lunch washed down with St George’s beer from Ethiopia, watched as St George tackled the dragon for the first time and the spring princess was released from his belly. 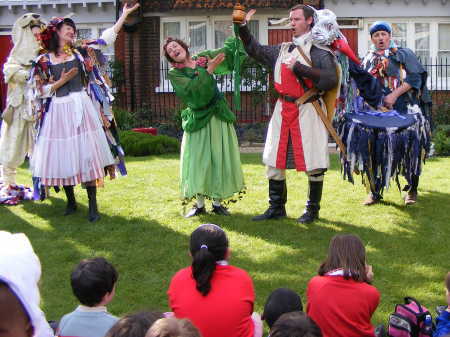 Then a short walk to Red Cross Garden, filled withÂ families andÂ children, just out of school, for 2 more performances – here the small boys learnt to encourage the dragon. Finally a procession to Southwark Cathedral, gathering people as it went, where tourists, visitors, office workers and a surprised group of clergy from Norway cheered on St George and good will spread around. Alex Scott gave a Guided tour of the cathedral before the 12.30 Chapter Mass at which 3 new canons were installed. The relic of St George was carried in procession. Back in Redcross Way John Constable hosted a gathering of those concerned about the future development of the Cross Bones Grave Yard, who remembered the ‘outcast’ poor’ with words and music. Other evening events included traditional Morris dancing by the local New Esperance Group, Hammersmith, a St George’s Day after work bike ride organised by Southwark Cyclists and Silver, and story telling of tales of courage by Vayu Naidu and Craig Jenkins and others at the Leather Exchange pub. On Saturday the weather was a bit chilly for a picnic and eventually everyone retreated to the warmth of St George’s Crypt. Here we enjoyed dances from the Moving Into Age group from Peckham and the Rockingham Somali ladies group. Several Ethiopian ladies prepared coffee in the traditional manner of roasting the beans over a flame first. Activities included making your own St George cake and BOST had brought tiny seedlings of snapdragons to plant up and grow at home. On display were the entries for the St George Festival competition on the theme of ‘Courage’. Fr Ray Andrews presented the prizes, donated by the Southwark Chamber of Commerce. OnÂ SundayÂ there was a rousing Eucharist to celebrate St George’s patronal festival – in his sermon Bishop Tom mentioned the themes of Charity, Chivalry and Courage which had featured in entries for the Competition and there was marvellous singing from the City of London Choir, Leoa Academic Male Voice Choir and the St Jude’s School choir. Before an expansive buffet lunch the Bishop blessed and Bob Skelly, a former mayor, officially opened the new St George Community Space in the crypt of the church. Over at Blackfriars Settlement the Older Persons were enjoying another lunch and danced their cares away to the strains of the band. The 2008 festival ran from 19 to 26 April. Download a report on the 2008 festival [PDF]. On St George’s Day itself local theatre group the Lions part gave three highly enjoyable performances of their specially written Ballad of St George & the Dragon, the first in Red Cross Garden, the second in Borough Market and the third at the meeting of the Borough & Bankside Community Council. Each performance had a different audience. The Southwark Mysteries and Mental Fight Club combined to run their popular Dragon Quest on the mornings of Saturday and Sunday. Dragon hunters gathered in Red Cross Garden in Redcross Way and began to search for the many dragons to be found, while learning about the folklore and mythology of dragons and the stories of St George. They ended at St George’s Garden where the dragon danced. On Saturday Stephen Humphrey of the Southwark Local History Library gave a talk about the history of the church and on Sunday Fr Ray Andrews presided at a Festival Eucharist. As well as two guided tours and a special Mass for St George’s day the cathedral showed a new painting by Scott Norwood Witts of St George and the Dead Soldier â€“ a contemporary meditation on St George and nationalism. To celebrate another of the borough’s literary connections, Arthur Smith and Rick Jones commemorated the 600th anniversary of the death of poet John Gower who is buried in the cathedral. Southwark Local History Library prepared a display of St George places in Southwark and the Children’s Library hosted two sessions for schools with story telling and music from the folk tradition of England by the Askew sisters. Blackfriars hosted a traditional Sunday Lunch, a St George’s day lunch and quiz and a Community Lunch with International Tea Dance, enjoyed by members of the Blackfriars Seniors and Crusoe club for the visually impaired and local residents.